A Russian rocket exploded in a massive fireball late Monday (July 1), destroying three navigation satellites after a failed launch that appeared to veer out of control shortly after liftoff and crash back to Earth. The unmanned Proton rocket lifted off from the Central Asian spaceport of Baikonur Cosmodrome in Kazakhstan at 10:38 p.m. EDT (0238 GMT), where the local time was early morning on Tuesday, July 2. Built by Russia's Krunichev State Research and Production Center, the Proton rocket was carrying three Glonass navigation satellites for Russia. It marked the fifth Proton rocket launch of 2013. A massive explosion erupts after a Russian rocket crashes into the ground following a failed launch from Baikonur Cosmodrome in Kazakhstan on July 2, 2013 Local Time. 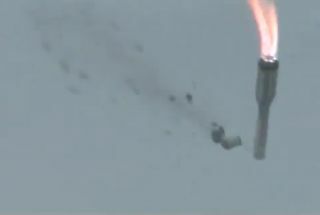 Russia's Proton rockets have suffered five major launch failures since December 2010. The most recent failure was in December 2012, when a Proton rocket launched a telecommunications satellite into the wrong orbit. The Proton rocket family returned to flight in March of this year and was followed by three successful flights until Monday's failed launch. This latest Proton rocket incident will likely lead to an in-depth investigation to trace the cause of the launch failure, with further launches awaiting the conclusion of that analysis.